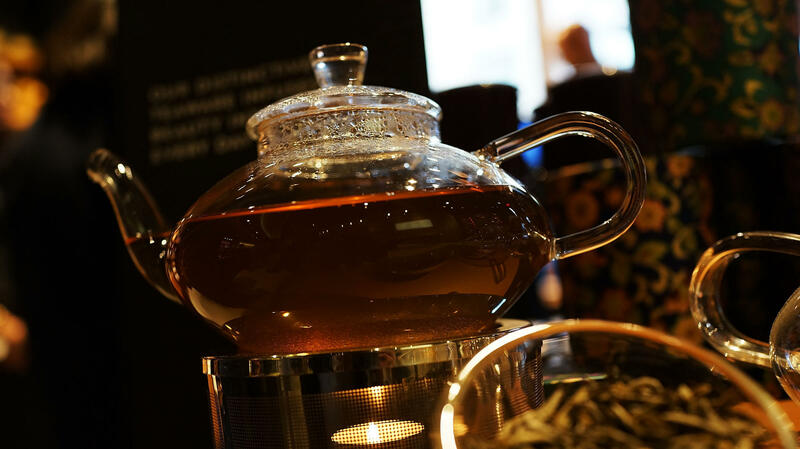 A pot of tea sits at the newly opened Teavana tea bar in New York City. Tea is served at the newly opened, Starbucks-owned Teavana tea bar in New York City. The cococaramel sea salt tea latte is delicious, but at 350 calories it's not an everyday drink. Cliff Burrows, regional group president of Starbucks and Teavana, says tea isn't new for Starbucks. "Our original logo from 1971 was coffee, tea and spice," he says. "But tea has always been secondary to the coffee business that we have grown around the world." The Tea Association of the United States says tea has been growing in popularity and, in the U.S., the wholesale value of tea has grown from $2 billion to $10 billion over the past 20 years. There are some 4,000 specialty tea rooms and retail stores. 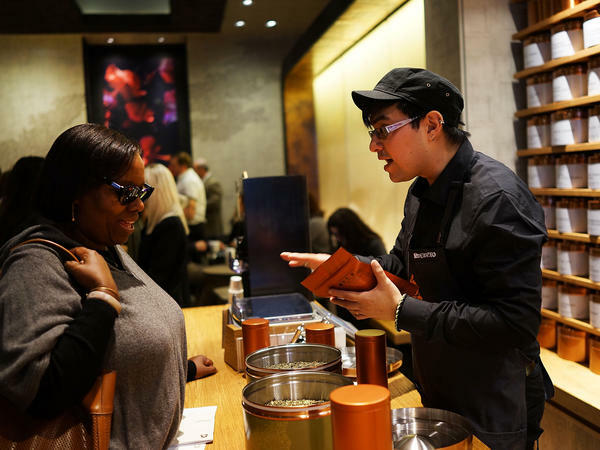 Less than a year ago, Starbucks bought Teavana with its 100 teas and retail shops. Bob Goldin, executive vice president of Technomic, a leading food service industry research and consulting firm, says it was a smart decision. "Tea consumption globally is actually far larger than coffee," he notes, "so I think they see this as another opportunity to capture the away-from-home-beverage market and do for tea what they have done for coffee." I ask Charlie Cain, a vice president at Starbucks, if this move will destroy the independent tea store. Absolutely the contrary, he contends. "In 1991, there were 1,600 coffee shops," he says. "By 2005, there were 14,000 independent coffee shops ... we think the same thing is possible for tea." But it's a little more complicated. Austin Hodge owns Seven Cups of Tea in Tucson, Ariz., which specializes in Chinese teas. Last year, it was named by Travel + Leisure magazine as one of the best places to have tea. Hodge says Starbucks' decision will change the world tea industry. It will be good for Seven Cups, he says, "because we can compete with Starbucks and Teavana when it comes to quality, so we are in a good position." But he says, "for smaller companies that are selling the same level of tea that Starbucks is selling, it's going to be a tough time." Burrows, of Starbucks, says he hopes people will come to the Manhattan store to find a mellow moment, but on the first morning, that's a tall order. "It's a little noisier than I expected," says Jana King. "The article I read said it was going to be a zen-like experience. " But when I go back a few days later, it is quieter — maybe not zen-like, but closer. Of course, I wonder, will the $1 cup of tea, which you can still find on the streets of New York City, go the way of the $1 cup of coffee? First, Starbucks revolutionized the coffee industry; now, it's taking on tea. It has just opened its first tea bar, where it's creating mixed tea beverages, some even more complex and customized than its familiar coffee concoctions. NPR's Margot Adler reports. MARGOT ADLER, BYLINE: This first store - on Madison Avenue, in Manhattan - has minimalist decor; gray, soft seats; charcoals, chestnut browns. Teavana teas line one wall. Beakers filled with colored liquids greet you at the entrance. And the food behind the counter looks like someone put Starbucks products into a wormhole, and everything came out just a little bit different. UNIDENTIFIED MAN: So we'd love you to try this one, this is a cocoa caramel sea salt. ADLER: It's a tea latte, and it's delicious. But at 350 calories, it's not an everyday drink. At the opening evening event, Cliff Burrows, group president of Starbucks for the Americas and Teavana, says tea isn't new for Starbucks. CLIFF BURROWS: Our original logo from 1971 was coffee, tea and spices. But tea has always been secondary to the coffee business that we have grown around the world. ADLER: The Tea Association of the U.S. says the wholesale value of tea in this country has gone from 2- to $10 billion over the last 20 years. There are some 4,000 specialty tea rooms and stores. Less than a year ago, Starbucks bought Teavana, with its 100 teas and retail shops. Bob Goldin, executive vice president of Technomic, a leading food service industry research and consulting firm, says it was a smart decision. BOB GOLDIN: Tea consumption globally is actually far larger than coffee, so I think they see this as another opportunity to do for tea what they have done for coffee. ADLER: I asked Charlie Cain, a Starbucks vice president, if this will destroy the independent tea store To the contrary, he says, and he says what industry watchers often say - Starbucks actually elevated the entire coffee industry. CHARLIE CAIN: In 1991, there were 1,600 coffee shops. By 2005, there were 14,000 independent coffee shops. So Starbucks certainly didn't hurt the independent, and we think the same thing is possible for tea. ADLER: But it may be more complicated. Austin Hodge owns Seven Cups of Tea in Tucson, Ariz. Last year, it was named by Travel and Leisure magazine one of the best places to have tea. Hodge says Starbuck's decision will change the world tea industry. For Seven Cups, that's good. AUSTIN HODGE: Because we can compete with Starbucks and Teavana, when it comes to quality. So for us, we're in a good position. For smaller companies that are selling the same level of tea that Starbucks is selling, it's going to be a tough time. ADLER: Back at the Tea Bar, I go behind the counter while they mix up something special for me. UNIDENTIFIED WOMAN: Plain tea or flavored tea? ADLER: ...I like straight up and down. UNIDENTIFIED WOMAN: We will do the Dragon Fruit Devotion. ADLER: It's a ruby red liquid that they put into a carbonation machine. The next morning, Katherine Weinhoff walks into the tea bar. KATHERINE WEINHOFF: I had both of the samples. There was a peach-infused one, which was marvelous; and the chai tea was spectacular. ADLER: And what do you think of Starbucks doing this? ADLER: It says Teavana, so it's not obvious. Francis Pedraza and Jana King take some samples. FRANCIS PEDRAZA: I saw this beautiful store, and I love tea. JANA KING: I am a big tea drinker; I don't drink coffee. And I've always wanted a tea bar. ADLER: Burrows, of Starbucks, says he hopes people will come to the store for a mellow moment. On the first morning, that's a bit hard. Jana King. KING: It's a little noisier than I expected it to be because the article I read said it was going to be a zen-like experience. ADLER: When I go back a few days later, it is quieter. Of course, does this mean the $1 cup of tea, which you can still find on the streets of New York City, will go the way of the $1 cup of coffee?